The Marvel Universe has a brand new Wasp—and now she’s stepping out into the spotlight of her own ongoing series. Nadia Pym is the Unstoppable Wasp, and we sat down with series writer Jeremy Whitley to discuss what she’ll be up to, her scientific legacy, and bringing a new female hero to Marvel Comics. Following her arrival on the scene in All-New, All-Different Avengers earlier this year, Nadia Pym has lived a life of seclusion, hidden from the mysterious forces she first escaped from—and protected by her stepmother (and fellow Wasp) Janet van Dyne from the truth about her father, Hank Pym. But now, having taken on her own mantle as the Wasp, Nadia’s striking out into the world of superheroes in The Unstoppable Wasp (by Jeremy Whitley, Elsa Charretier, and Matthew Wilson) with the hope that she can use her scientific know-how to help change the world for the better. Check out our interview with Whitley below, as well as a full preview of the first issue making its debut here on io9—and some variant covers for Unstoppable Wasp #1.
io9: This is your first ongoing series for Marvel Comics. 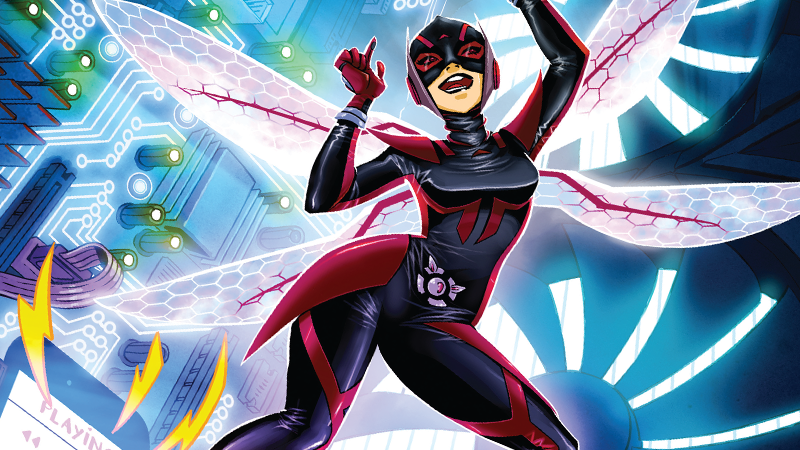 How were you approached for Unstoppable Wasp? Jeremy Whitley: I like to think it has something to do with my annoying stubbornness. I had approached Tom [Brevoort, Marvel editor] about working with Marvel about a year and a half ago. I’d gotten him copies of my creator owned series Princeless and he’d let me know that he would reach out if he had anything. I got a chance to work on a couple of short stories at Marvel in Secret Wars: Secret Love and Civil War II: Choosing Sides but I was always asking and looking for new stuff. Finally Tom told me they thought they had something that would be a good fit for me. The new Wasp had just been introduced for Free Comic Book Day and they were looking at putting together an ongoing series for her and they thought my work made me a good candidate. I pitched my ideal for what the book would be and they greenlit it with very few notes. The process has honestly been amazing. My editors have been excited about almost everything I’ve suggested and extremely supportive. io9: What was your first reaction to Nadia after her reveal in All-New, All-Different Avengers? How has she evolved as a character for you, now that you’re getting to shape her first solo series? Whitley: The first thing I picked up on about Nadia is that she was, as our title says, “unstoppable.” She has had an objectively terrible life. She was taken from her mother as an infant. She was raised in a Siberian facility to be an assassin and then an evil scientist. When she finally used her wits to escape her captors, she traveled all the way to the United States to meet her father, only to find out he had just died saving the world. Any normal person would just give up on everything then and there. They would stop or go back to what they knew. But not Nadia. Nadia’s immediate reaction was to pick up in her father’s footsteps, become a superhero in her own right, and try to use science to change the world. She’s optimistic to an incredible degree. You might expect a character coming from that background to be a gloomy antihero or femme fatale—not unlike Winter Soldier or Black Widow—but instead she’s become this bright spot in the Marvel Universe. io9: Tell us a little bit about where we find Nadia at the beginning of Unstoppable Wasp. Whitley: Well, Nadia has a lot to deal with. In All-New All-Different Avengers, we found out that multiple criminal organizations are trying to get their hands on her and she’s technically not even a legal citizen of the United States. She has no way of proving who she is, and 16 years of life to make up for. She’s living in her father’s house in New Jersey and she’s basically treating the whole house as a lab. Luckily she has a few people looking out for her: her stepmother Janet Van Dyne (the original Wasp), Avengers butler and lifelong friend of her father Jarvis, and her former Avenger pal Ms. Marvel. io9: As you mentioned, Nadia has a very close relationship to Janet Van Dyne and Jarvis—will any other familiar faces show up beyond those two? Whitley: Absolutely. The funny thing about Nadia is that she doesn’t know much about other super heroes, but she knows a lot about other scientists. As it turns out, in the Marvel Universe there’s quite a bit of crossover between those two groups. Her time with the All-New All-Different Avengers has already introduced her to the brilliant young minds of Kamala Khan and Miles Morales, but Nadia knows all about every major scientist in the MU, from Bruce Banner to Monica Rappiccini. She may be the only superhero on the books who looks up to people who work for AIM. io9: What’s it been like working with Elsa Charretier on the series? Whitley: Amazing! Elsa is the absolute best. It’s a funny thing, we’re not even in the same country and we collaborate as closely as any artist I’ve ever worked with. I love that she brings something new to every page. I’m used to coming up with challenges for artists, but Elsa has come up with a few new challenges for me. She came up with the idea for the “neat science facts” that pop up in the issue, which are now some of my favorite parts. And don’t even get me started on her style. She reminds me a lot of Darwyn Cooke and that’s not a comparison I throw around casually. io9: It was recently announced that each issue of the book will feature spotlights of real women in STEM fields, given Nadia’s science aptitude. Can you tell me a little a bit about how that idea came about? Whitley: Well, it was a nice confluence of things. I had already been looking for ways to include real scientists in our story and I had just asked our editors about doing something fun with the letters page, in keeping with the tone of the book. Elsa simultaneously came up with the idea of profiling real female scientists on Tumblr or Twitter to help promote the book. When she came to me with the idea, it seemed like a natural fit for our book. Part of the story is about recruiting geniuses for Nadia’s new lab, so we’ve started profiling bright women in STEM fields as part of Nadia’s recruiting effort for her lab, G.I.R.L (Genius In Action Research Labs). io9: Did you have to reach out to scientists to make sure you were portraying things accurately, or does superheroic scifi give you a bit more wiggle room with things? Whitley: It’s a little of both. I want the science to seem probable. Part of making a science fiction or superhero story is to take a leap forward in science, but I think the key to making it work is to keep the science to the point that it seems like a leap forward and not like magic. I’ve had to check in with a couple of science folks I know, but also with a few comic writers who have been around longer than I have. There’s an explanation for how something that’s been in comics longer than I’ve been alive works, and I had to make sure that in the decades since the process was created it had never been explained in a way that contradicted what I was writing. I owe a big “thank you” to Mark Waid for assuring me that I didn’t have to read 50 years worth of Avengers books just to be sure I wasn’t messing up continuity. io9: You’ve got experience with female-lead comic series thanks to your work on Princeless. How important was it for you to be writing for a new, young, female hero in the Marvel universe? How has developing Nadia compared (or contrasted) to your work developing characters like Princess Adrienne? Whitley: It’s so important to me. Honestly, I’m sure if somebody asked me to write Spider-Man or Captain America tomorrow, I’d come up with something, but the characters for whom I have real love and story ideas dying to get out are the younger generation of heroes. I love characters like the Runaways and Young Avengers. Nothing makes me happier than getting to write great young characters. In a way, it’s so much easier to develop a character for a company than on my own. All of the characters in Princeless as well as the stories and world all were built from the ground up in my head. That takes a lot more time and effort. With Nadia, the character was already there. What I had to do were find the things about her I loved and tell the best stories I could inside the existing universe. io9: One final question I can’t help but ask: As far as Nadia knows, her father Hank Pym is dead—but as Marvel fans know, Hank’s returned to earth in the pages of Uncanny Avengers, and is merged with Ultron. Will she learn more about her father and his current fate in Unstoppable Wasp? Whitley: So far the adults in her life (namely Janet and Jarvis) have chosen not to tell Nadia about either Hank’s return or some of the less positive aspects of his personality. They want to preserve this idealized version of her father that Nadia has in her head. There are more than enough things for her to be upset about without going through every detail of her father’s complicated past. However, I think it’s fair to say that we plan for Nadia to learn more about herself and her father. In fact, she has a whole weird little family full of robots and magic I look forward to introducing her too. I mean, her brother Ultron made his own kid, Vision, who somehow had two children with the Scarlet Witch. I mean, she’s the great aunt of Billy Caplan and she’s only 16. How do you deal with that? The Unstoppable Wasp #1 hits shelves next week, on January 4th.